One of the first things people notice when they begin low-light training is exactly how much smoke is created when you discharge a firearm. The amounts are magnified when firing high-velocity rifle rounds. Plug a flashlight into the equation and the smoke becomes even more apparent from all the reflection created by the light. Depending on what type ammo you’re shooting and how many rounds you fire the smoke can become dense enough it starts to limit your vision, which drastically affects your capabilities. There are a variety of different ways to deal with this problem, and as always the situation determines your best option. An easy, quick technique to apply is simply stepping off line from where you were firing. Taking a step or two laterally away from the location you were firing puts gives you a different view of the area without having to look through as much smoke. The circumstances determine whether you leave the light on, maintaining visual contact with the threat as you move, or turn the light off so it doesn’t attract fire from any additional sources you haven’t located yet. When you have a good covered position or the situation doesn’t allow you to move then after firing a few shots you may need to turn off the light, let the smoke clear, then turn the light back on to see what’s going on downrange. Even with a weapon mounted light there are a lot of reasons to have a hand-held with you. For example after firing using the weapon mounted light you can use a hand-held light, holding it off to the support side like the old F.B.I. technique so the light is shining from a different angle and isn’t creating as much reflection off the smoke and penetrates more into the environment. A capable partner works really well in low-light situations. They can light the threat from another location while you fire, or you can light the target up, fire and cut your light off. As you kill your light they turn their light on to keep a visual on the target. Obviously this takes some planning, practice, and communication. 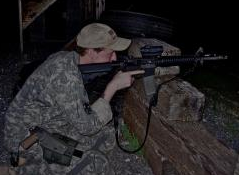 There are all type tricks or techniques for dealing with the fog of war that results when you start firing off rounds in low-light environments. For example you may figure out that while your red-dot works great on setting “X” for using the flashlight once the smoke pops it needs to be a little brighter. The key, as always, is to figure out how to use your gear properly what techniques work well in advance so it’s not a distraction when you have to deal with it for real. Since we know that the majority of confrontations occur in low light environments it’s up to you to make sure you’re ready. 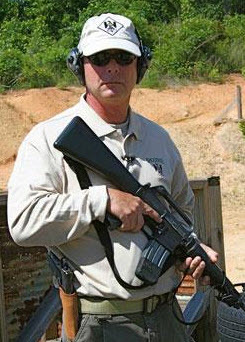 The only way to get this experience is to hit the range for live fire practice, in the dark, using both hand-held and weapon mounted lights.